Svarog was revered by the Slavs as the great god of blacksmiths, law and fire, similar to that of Hephaestus of the Greek pantheon. The origin of Svarog’s name can be traced to the language of Indo-European people, that is to say Sanskrit. Although an exact link has yet to established, some theories suggest the name comes from the Sanskrit word ‘Svarga’ meaning the sky or heaven. 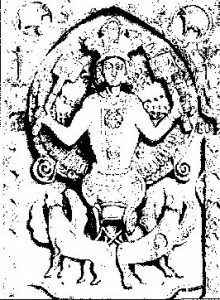 Another theory suggests Svarog’s name came from the Indo-Aryan word ‘svar’ meaning the sun, although this theory is discounted by some as the Slavs had possessed a different word for the sun at the time. Since this is not an actual Slavic myth per se, historians are uncertain as to how much of the myth is indeed applicable to Slavic pagan beliefs, specifically the sons of Svarog. As mentioned above, Svarog had fathered Dazhbog as well as several other gods, these being Perun, Svarozivic, Stribog, Semargl, and Radogost. It is generally believed that Dazhbog and Svarozivic are the same god, as the book of Kolyada mentions Dazhbog’s birth during the striking of the Alatyr-stone, but Svarozivic, who has been attributed to nearly the same aspects as Dazhbog was not mentioned. This belief is furthered by the idea that ‘Svarozivic’, which was used to describe the sons of Svarog in the Book of Kolyada, may have just been a word meaning ‘of Svarog’. The birth of Svarog’s sons is described in the Book of Kolyada’s myth of the creation of the mortal world, one of several myths involving Svarog. The myth states that a great rock, the Alatyr-stone, was brought from the depths of the ocean by a great duck. The rock possessed great magical powers and for this the duck had wanted to hide the stone in it’s beak. Upon finding the duck, Svarog uttered a phrase which caused the stone to grow in size and eventually become too large for the bird to carry. Soon the stone had become a great mountain and later a center of knowledge of the tales of the gods (vedas) and a mediator between god and man. But upon seeing this, Svarog had decided that no man must know of the stone. With this, he struck the stone with his hammer, but he was only successful in creating sparks. With these sparks, the ratichi (celestial warriors, that is to say gods) were born, this included Semargl, the great god of fire. Because of this, the mighty winds rose, thus creating Stribog, the god of the wind. After this, the duck who had previously carried the stone conceived a great black snake. The snake, sent to end the stone, crept up to it and struck it to the ground. the stone fell from the heavens and eventually came to be in the land of the mortals (The exact spot was said to be Mount Elbrus in the Caucasus mountains). The impact of the drop had sent black sparks across the world, with this the dark forces of the world were born. Now Semargl had begun to fight with the snake and it’s troops, but he was outmatched and soon the sun had been blotted out by the snake and the world had been overrun by it’s minions. Defeated, Semargl ascended to the heavenly smithy, followed closely by the great snake. Seeing this, Svarog grabbed the snake’s tongue and tamed it so that it may plow the fields of the earth, whilst sending it’s minions to the underworld. Following this great victory, a half-horse by the name of Kitovras (Known to the Greeks as Chiron) constructed a temple around the stone with the most sacred area in the temple, an altar, being the place where Svarog spoke with man. The myth mentions it was here where Svarog taught man how to make food with milk and cheese curds, which is why the Slavs considered such a meal was a gift from the gods. Since then, this stone has been sometimes attributed to Svarog and in this way he is seen as the creator of the mortal world. Meanwhile, Svarog had also created the blue Svarga, a land in the heavens where it was said the acnestors of the Slavs would live after death (which is contradictory considering the fact another myth states the souls of the dead would go to the land of Nav, an underworld of sorts). It is a possibility that these two concepts were influenced by separate mythologies, that is to say the Norse and Greek ones, respectively. It is not unlikely, as this conflict of mythologies had been seen before in other parts of Slavic mythology. 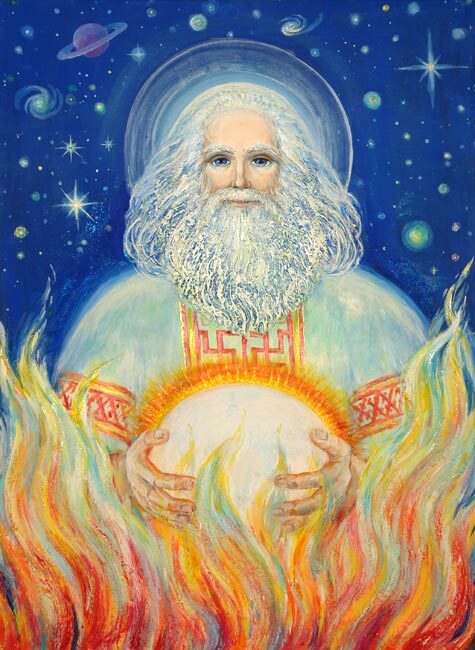 It was believed the stars of the night sky were the eyes of the grandfathers, who look down from the Blue Svarga upon the Slavic people’s earthly affairs. Svarog, unlike Veles, does not create the material world with words or magic, but rather his hands. 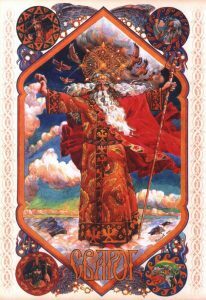 He cared about the Slavs, giving them fire for the cold and to cook food as well as the Sun-Ra (sun) which later became the word for joy (Radost). He also came to the earth to plow the fields and gave the Slavs several gifts. The first, an axe of which to defend their native lands from enemies and the second being a bowl to prepare sacred drinks and the third being tongs of which to create forged weaponry. Finally, his last and possibly most important contribution was the creation of the two circles of time, one of the ground and one of space. The Book of Kolyada makes one final large mention of Svarog, this being the tale of Svarog and Dy. As Svarog ate a feast, several badly-beaten warriors entered the hall and claimed that had been attacked by the Volot-giants of Dy, god of the sky and thunder under the command of his son, Churila. Angered by this, Svarog gathered the heavenly army and marched towards the kingdom of Dy in the Ural mountains. Upon arrival, Svarog’s army defeated the soldiers of Dy and sealed his royal subjects below the mountains. After this, Svarog and his sons decided to hold a victory feast within the palace of Dy. Begging for forgiveness, Churila had offered expensive gold and jewels to Svarog, convincing him to take Churila into service. Like the rest of Dy’s children, Churila was very handsome, this caught the eye of Lada, who began to remark on his looks. To this Svarog replied “As Dy dims his eyes, so the night dims reason..get thee away from the table, Churila!”. After this, Churila began to serve Tarusa, wife to the god of prayer, Barmas. Depiction-wise, it is hard to find a true and definite idea of what the Slavs imagined him to be. One source says Svarog was seen as a flying fire-breathing dragon, this idea was later set aside as pagan beliefs developed. 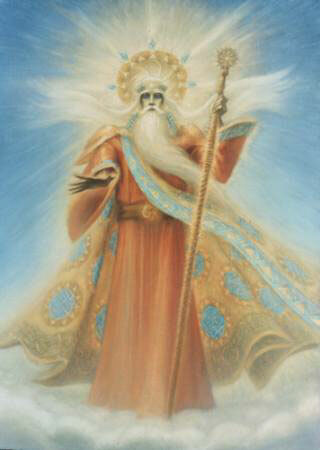 Most commonly, Svarog was thought to be part of the trinity of creator gods, Triglav, among Dazhbog and Perun. Although besides this, the way in which Svarog was honored by the Slavs is not known, nor are any other details on his appearance or personality. As Christianity began to take hold in Eastern Europe, the idea of Svarog was replaced by Saint Damian, Saint Cosmas and Michael the Archangel. Although paganism was being replaced by Christianity, many were reluctant to give up their old traditions which is why so many attributes of the pagan gods were given to Biblical characters or saints. When assessed, it would seem that the concept of Svarog, and indeed his attribution of being a lawmaker and blacksmith came out of the Slavic people’s entrance into an iron age, which brought about advances in weaponry and agriculture. The various tribes scattered along the land had seen Svarog as the bringer of these advancements, which would explain why he was first mentioned when Slavic tribes developed agriculture around 800-600 BC.